Lacing is the oldest known form of sewing; early man made holes in animal skins and laced the skins together to form body coverings. As man and sewing became more sophisticated, the holes were reinforced with thread to protect them from wear and tear; the bound holes became known as eyelets. 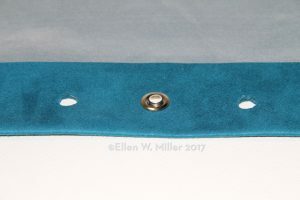 Grommets, which cover larger holes than eyelets, are fashioned from two pieces: an eyelet with a barrel and a flat washer. 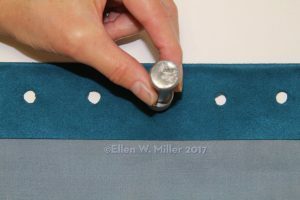 When the grommet is pounded or pressed flat the barrel collapses onto the washer to cover the fabric in metal. 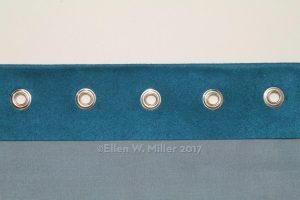 Prepare a pattern and create the holes in the same way as for eyelets. Insert the grommet through the hole from the right side. The hole should fit snugly around the grommet barrel. Lay the washer on to the barrel, on the wrong side of the fabric. Place the anvil under the grommet. 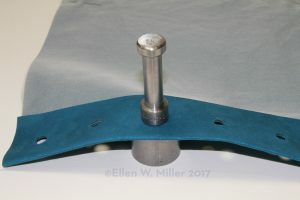 Insert the tapered end of the setter through the grommet and into the anvil’s center. Hit the setter firmly with the mallet several times. This should flatten the barrel over the washer edge, making a firm uniform circle of metal around the fabric hole. The grommets on the wrong side. 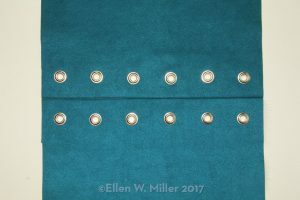 The two back panels with completed grommets.